If you follow our Monday Munchies you will know that we are big fans of The Ministry of Food by Jamie Oliver. In fact, since our celebrity chef reviewed this book, meatballs have become a once a week item on the menu. 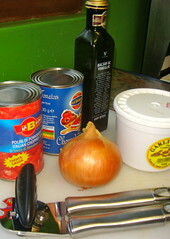 You can get the recipe from Jamie’s Pass It On Site. Trust me on this: take the 8 minutes to watch the meatballs video, its worth it! Seriously, this meal looks so impressive and there are a lot of steps to this recipe I thought it would be quite tricky. Turns out each step is an easy step, just watch the video! 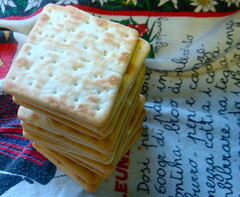 Step 1: Lets sort those crackers out – I have always wondered what to do with cream crackers! Take half the packet and wrap them in a dish towel. 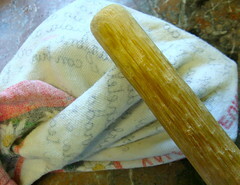 Then smash them up with a rolling pin. I had a lot of volunteers for this task!!! 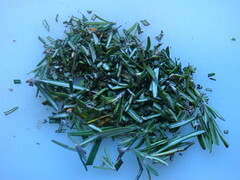 Step 2: Take your rosemary off the stem an finely chop it up. 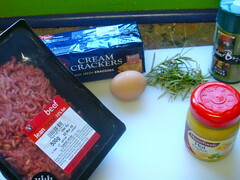 Step 3: Pop your mince into a bowl, add your dollop of mustard, add your egg and toss in your herbs. Toss in your rosemary. 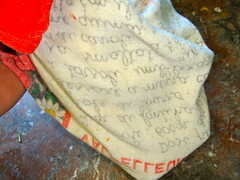 Then toss in you bread crumbs. Step 4: Mush it all together and make a ball of mixture in the bowl. 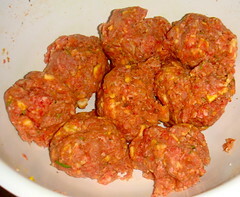 Step 5: Now I just keep halving the mixture until I have the right size meatballs. 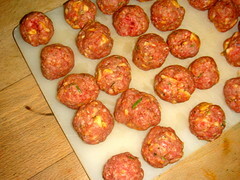 Then I lay them out on a tray, cover them and pop them in the fridge until I am ready to cook them. Step 6: When you are ready to cook them drop some oil into your pan. 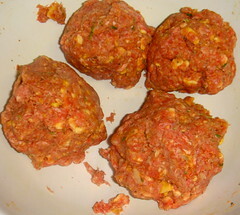 And when it is hot toss your meatballs into the pan and turn and turn and turn them until they are nicely browned and cooked through. 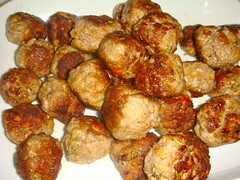 Step 7: Put your cooked meatballs to the side until you are ready for them. 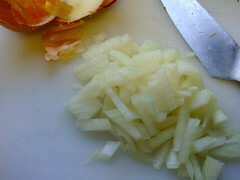 Step 1: Chop your onions up finely. 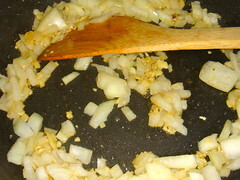 Step 2: Add your garlic and onion to your pan with a glug of olive oil. And gently soften them up until they turn golden brown. 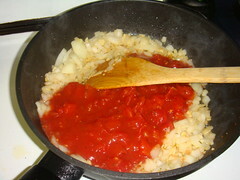 Step 3: Toss in your cans of chopped tomatoes. 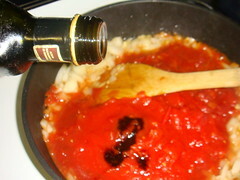 Step 4: Add a glug of basalmic vinegar. 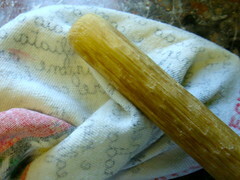 Step 5: Let it bubble, bubble, toil and trouble… yummy! 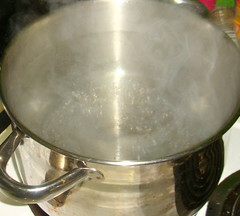 Step 1: Boil up your biggest pot of water and add salt to it. You need to add more than a pinch. Remember no salt means tasteless pasta. 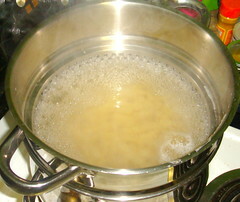 Step 2: Pop the pasta into the pot and boil away until your pasta is cooked. 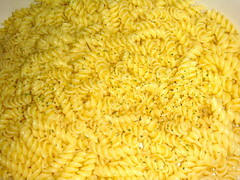 Step 3: Drain your pasta and toss it out into a large dish. We added some herbs to our pasta at this stage, we always do. 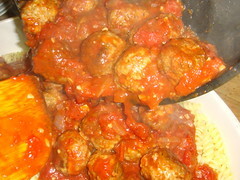 Step 4: Pop your meatballs into the tomato sauce and warm them through. 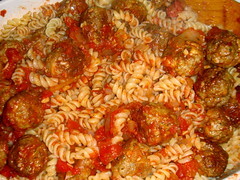 Step 5: Pop half of your meatball mixture into your pasta and stir it through. Pop the other half on top. 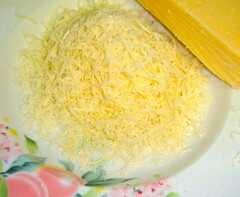 Step 6: Grate a large hand full of parmesan – yum! 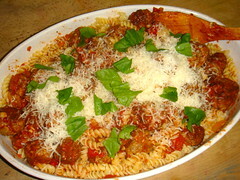 Step 7: Toss the parmesan on top of the pasta and meatballs. And tear a few basil leaves on top of it. Can you descirbe what Cream Crackers are? I’m live in Australia and I’ve never heard of them … I guess we just use a different name. Are they like watercrackers, which I’d serve with cheese on top? Thanks for asking! And have a good day! 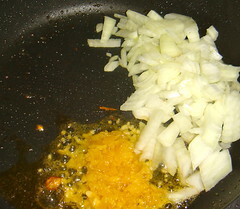 mix and pour in a buttered dish. put in the fridge till hard. very very very nice. Hi D, Anything with a can of condense milk is a good thing! Thanks for the tip! Have a Good Weekend!